San Diego High has a rich history, dating back to 1882 when it opened its doors as Russ School. By 1902, the population was too much for the small, one building school, and a new building, known as “The Old Grey Castle” was constructed and dedicated as San Diego High School in 1907. In 1914, Balboa Stadium was built behind San Diego High School, and would go on to become the home of the San Diego Chargers for six seasons, from 1961 to 1966. However, during the mid-1970s, several of San Diego High’s buildings were deemed as not earthquake safe,leading to the demolition of “The Old Grey Castle” (Information gathered from San Diego High School History). The loss of the original buildings changed the face of the campus but not its job in educating students. In 1982, the school celebrated its centennial anniversary of 100 years of educating students. In 1995 the school’s student population (then only grades 10-12) had grown to approximately 1,700, and saw the construction of the 800 building. 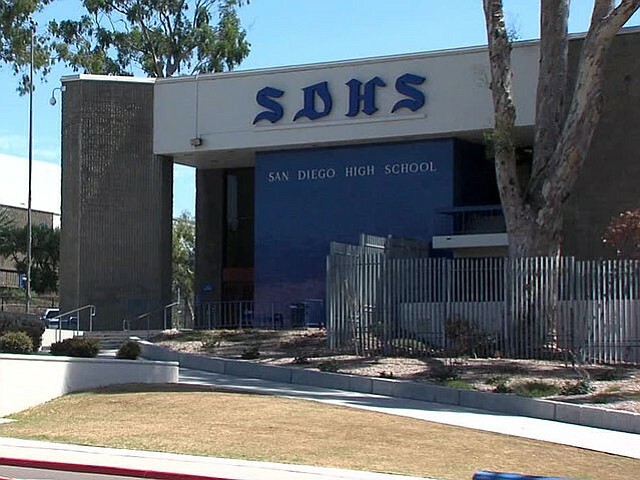 After the decision to include the 9th grade at San Diego High, the 900 and 1000 buildings were constructed during the 2002-­2003 school year. In 2003, it was decided by the faculty and school community to reconfigure San Diego High. The school was originally divided into six small theme-based schools. Of the original six, three remain: School of Business and Leadership, School of International Studies, and the School of Science and Technology. Today, San Diego High School is one of 24 high schools in the San Diego Unified School District with nearly 2600 students in grades 9-12 supported by over 200 teachers and staff members.